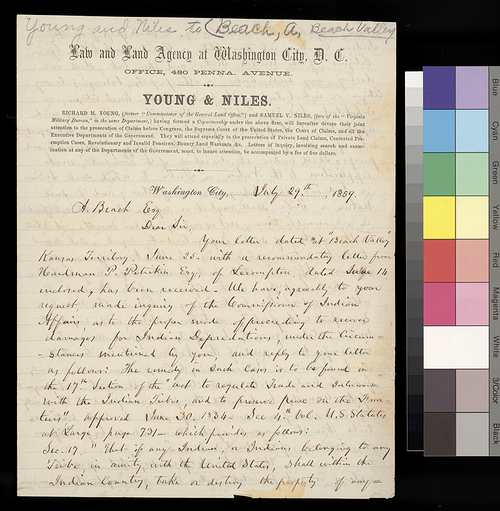 Written on stationery from Young & Niles, Law and Land Agency at Washington City, D. C., this letter to A. [Asahel?] Beach of "Beach Valley," Rice County, Kansas Territory, discussed the inquiry the law firm made "as to the proper mode of proceeding to recover damages for Indian Depredations . . . ." The attorney explained the statute of June 30, 1834, that covered this process and its provisions. Since Young referred Beach to the agents of the Kaws and the Kiowas (or "Indians of the upper Arkansas"), one might assume that his damage claim was connected to one of the raids by the latter tribe against the former.